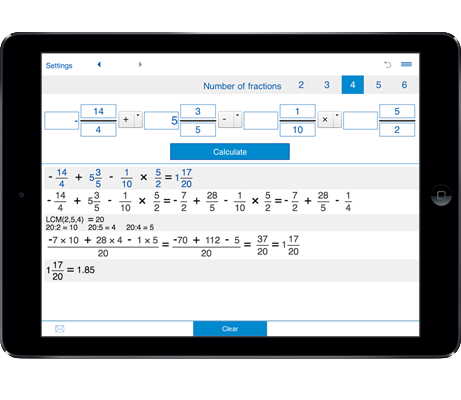 Fractions calculator with steps lets you add, subtract, divide and multiply fractions, mixed fractions, and whole numbers. You can select to multiply 2 fractions, multiply 3 fractions, multiply 4 fractions, multiply 5 fractions, multiply 6 fractions. 1. Set the number of fractions you need to multiply - you can select to multiply 2 fractions, 3 fractions, 4 fractions, 5 fractions, or 6 fractions. 2. Enter the fractions, mixed fractions or whole numbers you need to multiply.